B 1/c Robert L. Owens, husband of the former marilyn Rogers, graduated from Hollister High School. 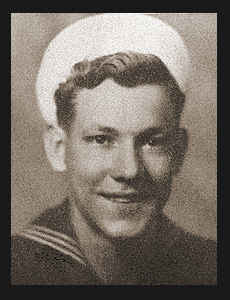 Entered Navy in Nov., 1941, trained in Great Lakes, Ill.; served in Bougainville, Green Island, the Emirows, Guam, Saipan, Livian, the Philippines, Iwo Jima, the Marshalls and New Britain, was discharged in Oct., 1945. Awarded ETO Ribbon with five Battle Stars.